There has been recent commentary suggesting the new developments in Chinatown are changing its character and threatening the heritage of the area. So far that really hasn’t been true – the sites that are being redeveloped are all either replacing recent (and unimpressive) buildings, or have replaced modest older structures that were too far gone, or small, to save. Here’s our second look at the unit block of East Pender on the north side of the street; (the first post looked at the other half of the block). Here we’re comparing 1981 and today, and if anything the street is in better condition: all the heritage buildings are still standing and almost unchanged. Up the street the Chinatown Gate has been added, and beyond it the Chatham Steel services depot has been replaced with a housing project for Chinese seniors and other community services. (The steel depot replaced Yip Sang’s much larger tenement building). From the right, and moving west, we can see the Yue Shan Society buildings – the edge of the 2-storey building that dates back to 1889, and the 1920s design by W H Chow for the three storey structure. Between the two buildings is a narrow alley that leads to a courtyard; behind that is a third building (from around 1914) that also fronts Market Alley (running parallel to East Pender). The Yue Shan Society provides aid to immigrants from Pan Yu (Yu Shan) County, near Guangzhou, China, and have occupied these buildings since 1943. Next door are two buildings that we featured a couple of months ago; the R J MacDonald designed Wong’s Benevolent association from 1910, and Ming Wo Cookware that dates to 1913 and developed by Wong Soon King. Beyond that is the Chinese Times building, developed by Yip Sang who hired W T Whiteway to design it, (and later W H Chow designed alterations). This iconic image captures the small townsite of Granville, just after it’s incorporation as the city of Vancouver. It’s not the earliest picture of the townsite, but it’s one of the last. Vancouver was incorporated in April 1886; the notice on the tree advertises the first election, held on May 3, 1886. Then disaster struck when everything – including the tree – was destroyed on 13 June 1886. A fire began as a brush fire to clear land between present-day Main and Cambie Streets and was spread out of control by a sudden strong wind. James Hartney ran a general store on the corner of Carrall and Powell in a building owned by American A G Ferguson. Also American, Mr Hartney arrived in town in December 1885. After the fire Mr Ferguson rebuilt, but in fireproof materials, while Mr Hartney became a contractor. He logged on the north shore, and in 1888 he built the road around Stanley Park (using the historic shell midden built up over hundreds of years by the areas’s First Nations village residents). Next door to the south was the Glory Hotel, which today has the two additional floors added by Frank Filion and designed by Parr and Fee. Beyond that was the Tremont Hotel, (which today has the name of a later occupant, John Abrams). Today’s tree is close to, but not exactly located where the original tree stood. It was a bit further south, although not quite where Gassy Jack now stands on a barrel. We’ve looked at the eastern end of this block in two earlier posts (most recently here), but this corner of West Pender with Seymour Street is about to dramatically change. The building on the corner hasn’t been positively identified before in terms of its developer and architect, as far as we know. By a process of elimination we’re reasonably sure that it was a 1905 investment by A St George Hamersley, designed by Honeyman and Curtis. The small building next to it dates from the mid 1930s, and the two are soon to be redeveloped as a new office building. 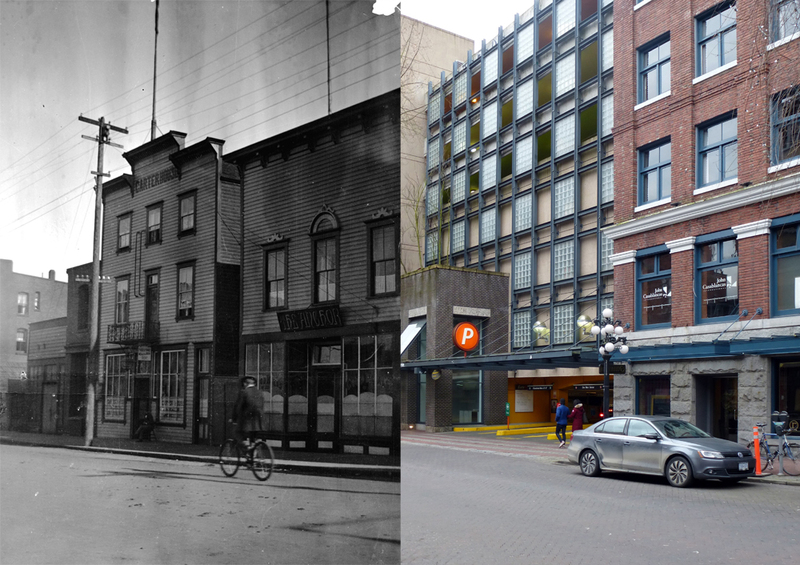 There’s an announcement for the block ‘at Pender and Seymour’ in the Contract Record in May 1905 for ‘A. St. George Hamersly’. Across Seymour, also on the south side of the street the Clarence Hotel was already built. To the north was the Delmonico Hotel which had been built in 1892. The fourth corner was redeveloped in 1908 with the Imperial Building, designed by Parr and Fee. That leaves this corner for Hamersley’s investment. 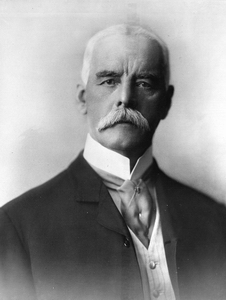 Alfred St. George Hamersley was from a well-off English family from Oxfordshire where he lived first at Haseley House and later to Church Manor House in Pyrton. He was educated at Marlborough College and at the Royal Military Academy in Woolwich. He moved to London where he became a Barrister-at-law in the Middle Temple in 1872, and two years later moved to New Zealand. He practiced law there, at the same time acting as a military officer (involved in the last military actions against the Maori) as well as being credited with introducing rugby to the youth of South Canterbury and founding the New Zealand Grand National Steeplechase Club. 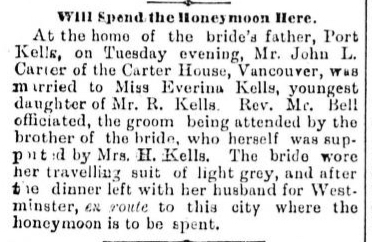 He married there, and started a family, before moving to the fledgling city of Vancouver in 1888. Newly arrived in Vancouver he somehow managed to become the first City Solicitor – a role he retained until he left the city some 17 years later, fulfilling the role from his private office on Hastings Street. He became first president of the BC Rugby Union in 1889, and also founded the Amateur Athletic Club of British Columbia. His many interests, law practice and role as City Solicitor may explain why the published 1892 credit rating for A St. George Hammersley (sic) was “Very slow, too slow for desirable credit”. He was in partnership as Hamersley and Hamilton in 1893, was appointed a Queen’s Council in 1901 and J J Godfrey joined him as a partner in his law firm in 1903. He bought 640 acres next to Kootenay lake in 1897, and became increasingly interested in real estate. The wearing of wigs was abolished in British Columbia in 1905, and Hamersley is said to have abandoned his legal practice as a result – it’s unclear if that’s what caused him to leave, or whether he had decided to return to England already. In the 1890s he had R M Fripp design a house on Seaton Street overlooking the Inlet. (Seaton was the smartest street in town; today’s West Hastings; the Hamersley home was the last on the street before the cliff edge at the end of Bute Street). Mrs Hamersley hired an architect called Blackmore – either William or his son Ted, to design alterations to the house in 1901. In 1902 he had acquired an entire District Lot on the north shore from the Lonsdale Estate. He had Honeyman and Curtis design “Langton Lodge”, set in park-like grounds. Today it’s called Hamersley House and is a large Tudor Revival estate home set back on a large lot in a residential area east of Lonsdale Avenue. It’s two and a half storeys high on a full basement, and is unusual for having the main floor built of poured concrete. As a commuter to Vancouver from the North Shore, it helped that Hamersley had a controlling interest in the North Vancouver Ferry and Power Company, which established a regular ferry service across Burrard Inlet. 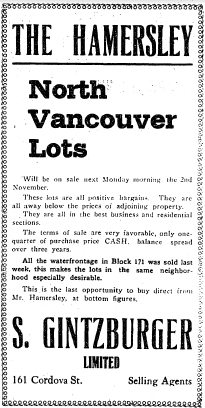 He set about selling his new investment, initially as the Townsite of Lonsdale but later as North Vancouver. One frequently mentioned episode relates his involvement in selling property to writer Rudyard Kipling. It’s not at all clear that Hamersley was the agent who sold Kipling land – although the two apparently did meet. Several inaccuracies exist in some of the versions of the story; (one has Kipling knowing Hamersley as a fellow lawyer – while in reality Kipling never attended University). The common content has Hamersley initially not knowing who Kipling was, and later (on a subsequent visit) suggesting it was Hamersley who sold Kipling some real estate including two lots at Fraser and 11th. Kipling wrote about the city after his first visit in 1889. “Except for certain currents which are not much mentioned, but which make the entrance rather unpleasant for sailing-boats, Vancouver possesses an almost perfect harbor. The town is built all round and about the harbor, and young as it is, its streets are better than those of western America. Moreover, the old flag waves over some of the buildings, and this is cheering to the soul. The place is full of Englishmen who speak the English tongue correctly and with clearness, avoiding more blasphemy than is necessary, and taking a respectable length of time to getting outside their drinks.” He might have had Alfred St George Hamersley in mind when he wrote that. Apparently he had an introduction to Hamersley, although he was only 23 years old, and only just starting to be recognized as a poet and author. Kipling is said to have bought the two lots in Mount Pleasant in 1892, on his second visit. He bought 20 acres on the North Shore in 1906, and as the Hamersley Estates were being actively marketed at the time, it could be where the land was located – although A St George himself had moved to England by then. 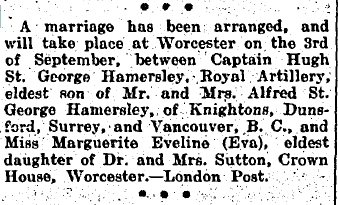 (Or so we thought – until we dug out this 1907 cutting in the Sunday Sunset newspaper, which lists both Surrey (Engalnd) and Vancouver as the family residence). Kipling wrote about the first purchase in his book Sea to Sea “He that sold it to me was a delightful English Boy who, having tried for the Army and failed, had somehow meandered into a real-estate office, where he was doing very well. I couldn’t have bought it from an American. He would have overstated the case and proved me the possessor of the original Eden. All the Boy said was: “I give you my word it isn’t a cliff or under water, and before long the town ought to move out that way. I’d advise you to take it.” And I took it as easily as a man buys a piece of tobacco. Me voici, owner of some four hundred well-developed pines, a few thousand tons of granite scattered in blocks at the roots of the pines, and a sprinkling of earth. That’s a town-lot in Vancouver. You or your agent hold it till property rises, then sell out and buy more land further out of town and repeat the process. I do not quite see how this sort of thing helps the growth of a town, but the English Boy says that it is the “essence of speculation,” so it must be all right. But I wish there were fewer pines and rather less granite on my ground.” As Kipling wrote fiction, it’s quite possible that Hamersley is the subject – although he hadn’t (in anything we’ve read) – tried for the army and failed. virtues of sport, manliness and the empire. Despite being aged 66, Colonel Hamersley was initially in command of an artillery battery during the First World War, handing over command to a younger man in 1916 when the battery was drafted to Ypres and the Somme (although he was in France in 1917). Although he had apparently returned to England, Alfred continued to have a significant involvement in Vancouver. This Seymour building was completed in 1905; in 1906 he hired Parr and Fee to design a commercial building on Water Street, and in 1908 the North Vancouver land was still being subdivided and sold off. In 1906 he was still being quoted in the press concerning decisions his ferry company were making about the ferry service between Gastown and the Lonsdale Gardens, a recreational estate established by the company. Alfred St. George Hamersley died in 1929, but his wife, Isabella (who was apparently known in Vancouver by her middle name, Maud) lived to the age of 102 and died in 1955. The building was occupied as both offices and stores, tenants changing often over the years. In this 1974 image the Yorkshire Trust had their offices here. Most recently a Korean-based language school operated in the premises; before that there was a clothing store. We saw a view of some of these buildings in our last post, in 1922. Here they are in 1937: Western Music operated the main floor of the tall building on the right (developed by Leon Melekov) and upstairs the Rexmere Rooms were still open. We can find the names of the tenants, but not what all of them did for work. One was a chauffeur; there was a carpenter, a shoe shiner, a porter for the CPR, a longshoreman and a baker’s helper. James Minns, the owner of Olsen’s signs lived here with his wife, Louise. Elmer Steiner ran the Rooms, lived there with his wife Alice, and there was another Alice Steiner also living in the building (presumably a relative). The BC Music Festival shared the main floor for their offices. We have drawn a blank on the developer or designed of the two-storey building next door. The 1922 image showed an old house on the site, so it’s more recent than that. There was a fire in 1959 that gutted much of the property, and it was subsequently rebuilt at the same scale as the building seen here. For years it was home to a&b sound, with Sam the Record Man in the Western Music Building. In 1937 it was Gehrke’s Ltd, who were printers and stationers, and operated The Pen Shop. Down the hill, there was a permit for a 4-storey building costing $115,000 designed by Parr and Fee for Thomas Fee in 1910. That was never built; instead, a year later, a more modest single storey building was permitted for a restaurant, designed by Parr and Fee for E Farr, costing $20,000, which we think was opened as The Sussex Cafe. In 1937 McLennan, McFeely & Prior occupied the building with their hardware store. Mr Farr seems to have been a CPR employee; the only E Farr listed in the street directory was Edward Farr who lived on Burrard Street and was a masonry inspector for the railway company. He was also the only E Farr in the census in 1911: or rather, there was another but he was also called Edward and he was Mr. Farr’s son (still living at home, a stenographer with the White Pass and Yukon Route). His daughter, Alice Isabell was at home as well, aged 18. Edward senior was born in Ontario, but his children had been born in BC. Ten years earlier Mr Farr’s wife, Christina was recorded (12 years younger than her husband), and the children were recorded as Eddie, aged 12 and Alice aged 7. Christina was born in Scotland and had arrived in Canada in 1885, and died in 1907. The three storey building (still standing almost unaltered today) was designed by Sharp and Thompson for Robert Kerr, and completed in 1910. In 1937 it was occupied by Clarke and Stuart as a printers: we’ve seen that company before in other premises, on West Cordova and their earlier store further east. We saw a view of these buildings almost three years ago when we first started this blog. The taller building in this 1922 image is the 1913 building designed by Braunton & Leibert for the Standard Trust & Industrial Co at a cost of $50,000. That company had developed another building down the street a year earlier, and in the frantic development scramble of the times, planned another on West Hastings Street near Howe Street in 1913. This wasn’t the first building here – there were houses and industrial buildings from before the turn of the century. The building to the south (The Arts and Crafts Building) had three floors in 1922, and three more today. Leon Melekov was Managing Director of the company. As well as property development, Melekov’s other investment interest was oil – he was President of a two million dollar company in 1914 called Saxon Oil, looking to develop oil fields in the vicinity of Calgary. He appears to have moved on to the US once the Vancouver economy faltered: we know he was naturalized as American in California (and from that we also know he was born in Russia). In 1927 we find “An Ordinance granting a gas, light, heat and power franchise to Leon Melekov, his successors and assigns, for the purpose of furnishing the citizens of Flagstaff with gas, light, heat and power in the City of Flagstaff, County of Coconino, State of Arizona”. Eventually he apparently became disenchanted with the oil business – or so one might surmise from the title of his 1953 publication on the topic: “The Greatest Fraud Ever Perpetrated in America“. In the main floor in 1922 were Love & Co, who were furniture auctioneers. Upstairs were the Rexmere Rooms, run by John Melville. Several tenants are listed: a telegraph operator with the Great Northern Railway, a timber inspector and a carpenter, a female clerk with a photography company and three waitresses (two at the St Regis Café), a longshoremen and a swamper. The house next door pre-dated 1901: in 1922 it was home to Frederick Helliar who ran Helliar Transfer from the same address. (There were two other Helliars in the city who worked for the company, Job and Garnet, but they had homes elsewhere in the city). Today the Braunton and Leibert building is still standing, these days the upper floors are offices. The house was replaced some time in the next few years. Here’s a second look at The Carter House on Water Street, built by Lewis Carter in 1886, soon after the fire that destroyed the city. The original verandah was removed some years after erection before this 1898 image. There were three Carter siblings in Vancouver, Lewis, John and their sister Elizabeth. Elizabeth was married twice, and had two sons. The elder son was William F Finlay who became sports editor at the Vancouver World and later the Vancouver Sun. He gave a number of interviews to Major Matthews, the city archivist, that are our main source of information about Lewis Carter. He was killed with his wife Nancy in a tragic accident when his car wheels stuck in the tram line on the Granville Street Bridge and the car was struck by a tram. “My Uncle, Lewis Carter, crossed the continent five times, the first time in 1872. He was, for three weeks, on the survey line, the surveying of the route, of the C.P.R. from Port Moody to Vancouver. He had charge of the C.P.R. car building shops at Yale for two and one half years; they built freight cars there, and some of the first turntables. We’re not sure exactly when Lewis handed the hotel to his brother John to run. In 1892 (as this wedding notice shows) John was linked to the hotel, and we know he worked there in 1891 as the desk clerk, and from 1894 to 1897 as the bartender. 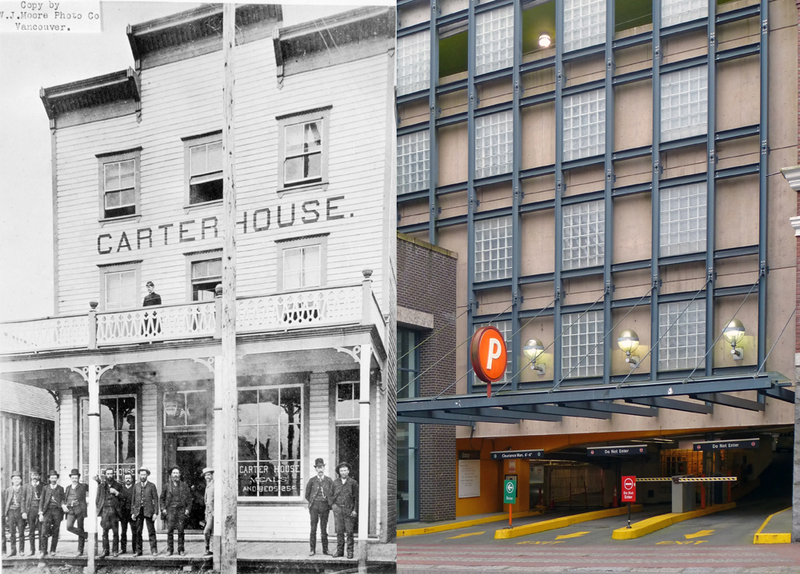 In 1898 he was shown living on Pender Street, and Louis was still proprietor of the hotel. Two years later John Lewis Carter was the proprietor, and a year later Mrs J L Carter was in charge. Lewis and Maggie Carter continued to live in the city, presumably in retirement. John was shown as aged 59, and Margarett 38 in the 1901 census, but as with many people we’ve looked for, they were missed in the 1911 census (or had moved away) They died in 1923 and 1925, and were buried in Mountain View Cemetery. 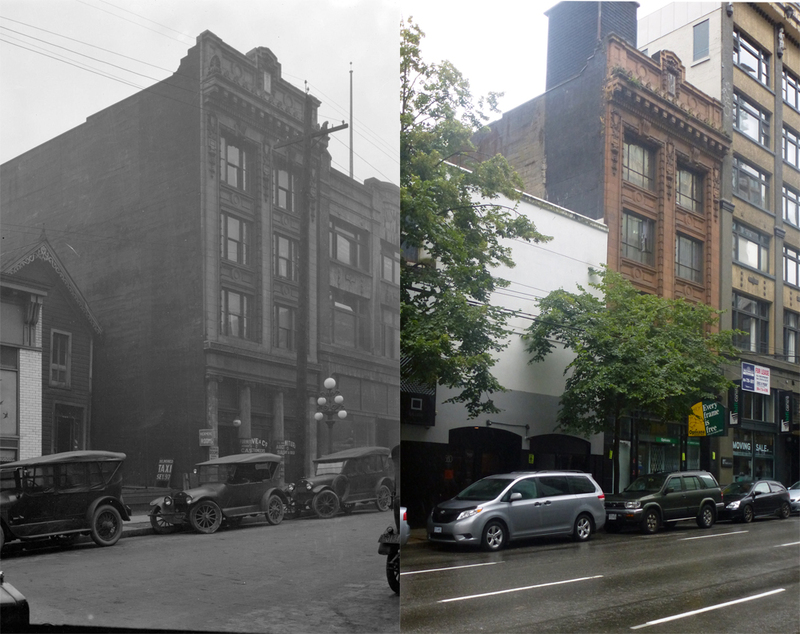 The hotel was demolished about 1921 or 1922, and the site was developed by Leckie’s with a new 3-storey warehouse designed by Downing and Kayll and occupied by the Pacific Mills Ltd., before being incorporated into the Woodward’s Water Street Parkade, now refurbished and rebuilt as the Gastown parkade designed by Henriquez Partners. In 1891 the census described Lewis as a hotel keeper, his wife, Margaret (from Ontario) was with him, nearly twenty years younger, and his brother, John, was there too as the hotel clerk. Over twenty lodgers were also recorded, from Ontario and New Brunswick, the USA, Scotland and England. They worked as loggers, mill hands, bricklayers and carpenters, tinsmiths and teamsters – a cross section of the trades building the rapidly expanding city. Margaret was the daughter of Robert McMorran who became a city Alderman for one term in 1898, was a member of the Orange Lodge, and who died in 1910. The photograph was reproduced by W J Moore from a copy of around 1887, and the people in it were identified by W F Findlay: on the veranda was Mrs. Margaret J. Carter, wife of the owner. The third from the left is C.E. McTaggart, afterwards manager of the Vancouver City Market (destroyed by fire) opposite the C.N.R. station; the fourth is Chas. E. Doering, of Doering and Marstrand, brewers of Mount Pleasant; the fifth Lewis Carter, the owner of the hotel; and the seventh John L. Carter, his brother and manager of the hotel. A painted sign states, “Meals and Beds, 25¢.” The 1887 date seems likely to be correct – although there had been buildings on the street since the 1860s, after the fire the street was still uneven and unpaved; only the wooden sidewalks were reasonably easy to walk on.